A Quickie Guide to the Chakras. I like to think that an increasing interest in the chakra system is a positive sign of our evolving society. That taking interest in our own health and what we can do personally do to increase our own emotional, physical, spiritual and mental well-being is a powerful development for the human race and that an understanding of the chakras will take us a long way in a healing direction. The Solar Plexus Chakra is located just below the rib cage and is responsible for our self-esteem, self-love and self-acceptance. A healthy Solar Plexus Chakra brings a sense of wholeness. However, the Solar Plexus Chakra is also our power center. Isn’t it a beautiful thought to think that our power comes from our wholeness? Now of course the Heart Chakra is love, but not romantic love or individual love. Instead it is universal, infinite, global, big love. The Throat Chakra is home to our authentic self, and of course the location for the expression of our authentic self. It is the connection between our mind and our heart. This is where we really shine. I think of the Crown Chakra as being the whole top of our head—kind of like the top of a hard-boiled egg. This is our place of true seeing and true knowing, the place of visionariness and daydreams and connecting with our spiritual truth. Worrying and doubt are the worst for the Crown Chakra. The 7th Chakra or Transpersonal Chakra is above our heads and governs our connection to the divine or the Universe or God or as I like to think of it, a benevolent force greater than ourselves who has our best interests at heart. Looking for more manifestation in your life? Then look no further then the 7th Chakra. 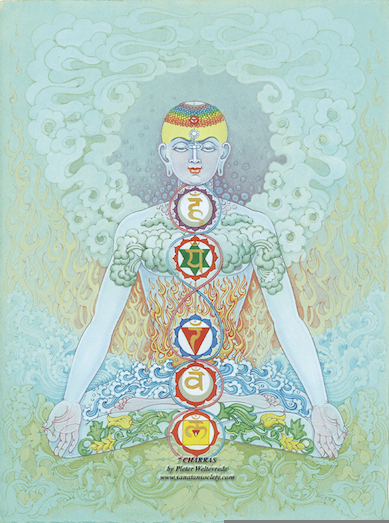 Learning about, healing and exploring the concepts of the Chakras is a life-long journey. But a little information and intention around our own Chakras can take each of us a long way along our own path of healing and self-exploration. 108 Ways to Heal Your Chakras. We developed it ourselves and designed since no sheetmetal store in the area would create a metal plenum. Very nice report Ruth. However I learned that the 6th chakra is located just behind the forehead and is called the third eye and that its element is light. The 7th chakra is the crown chakra located at the very top of the head and its element is mind. The diagram at the top of your article, I believe, illustrates this.